As low-cost generics come to dominate retail dispensing activity, clinics have emerged as a way for drugstores and other retail pharmacy outlets to diversify into non-dispensing revenues. There are now about 2,000 retail clinics. Below, I examine the chains with the biggest market share: CVS Health, HEB, Kroger, Rite Aid, Target, Walgreens, and Walmart. In 2015, the number of clinics grew slowly. In 2016, I project another year of slow growth as the big players retrench. While clinics sound like an exciting strategy, revenues from in-store clinics are—and will likely remain—a very small share of pharmacy chains’ prescription revenues. The table below summarizes our analysis of the current landscape for the biggest market participants. The data come from Merchant Medicine, which has a very impressive database of every U.S. clinic location. 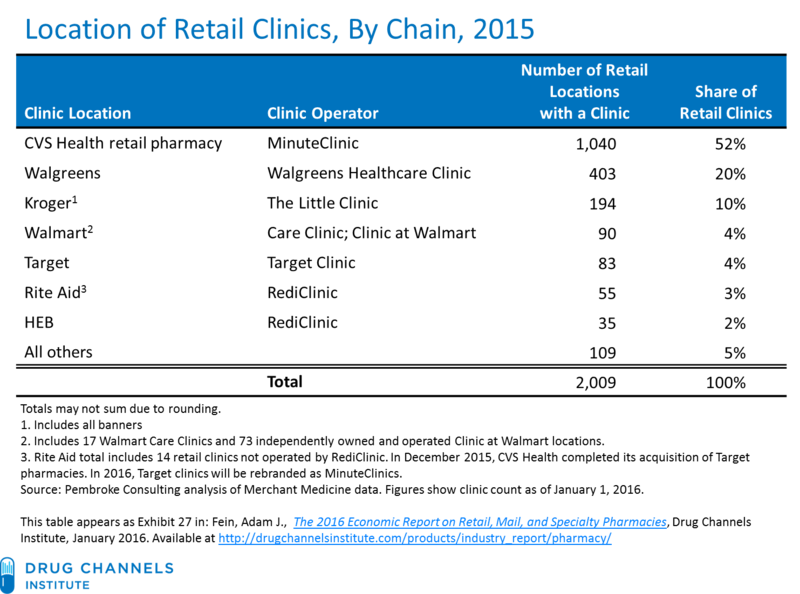 CVS Health’s MinuteClinic remains the largest and fastest-growing retail clinic business, now operating more than half of all retail clinics. As of January 2016, there were 1,040 MinuteClinic locations in 34 states and the District of Columbia. We estimate that 2015 revenues were about $350 million. Despite rapid revenue growth, MinuteClinics still account for less than one percent of CVS retail pharmacy dispensing revenues. CVS acquired Target’s 83 retail clinics when it acquired Target’s pharmacy business. CVS expects to integrate and rebrand these clinics by mid-2016. As a result of the Target acquisition, CVS plans to open fewer new clinics in 2016. Walgreens is the second-largest retail clinic operator, with more than 400 Healthcare Clinics (formerly Take Care clinics). The number of clinics in Walgreens retail stores declined in 2015. The company’s new management team and strategy seem likely to limit future investment in retail clinics. (See Walgreens Boots Alliance: Analysis of its New U.S. Pharmacy Strategy.) In January, Walgreens Boots Alliance announced that Advocate Health Care will lease all 56 of its in-store clinics in the Chicago area. The clinics are scheduled to reopen in May 2016 as the Advocate Clinic at Walgreens. Walgreens operates on-site pharmacies at three Advocate hospitals. Kroger has emerged as the third-largest retail clinic operator with its Little Clinic business, which operates inside nearly 200 Kroger, Dillon’s, Fry's, JayC, and King Soopers stores. The Little Clinic added more than 50 locations in 2015. Rite Aid changed its clinic strategy with the 2014 acquisition of RediClinic. As of January 2016, Rite Aid operated 41 RediClinics in Philadelphia, Baltimore, and Seattle. RediClinic operated a further 35 retail locations in HEB grocery stores in Texas. At 14 Rite Aid locations, the company leases space to other clinic operators, many of which are owned by hospitals. Given its pending acquisition by Walgreens Boots Alliance, it’s not clear how (or if) RediClinics will be integrated with WBA’s Healthcare Clinics. Walmart launched its own Care Clinics in 2014. There are now 17 Care Clinics in Walmart stores in Georgia, South Carolina, and Texas. Walmart partnered with QuadMed, which helps source, staff, and train the medical professionals in Care Clinics. Walmart’s Care Clinics accept traditional Medicare, Medicaid, and cash patients. They do not accept any private Medicare or commercial managed care plans. Walmart also leases space to independently owned and operated Clinic at Walmart operators. These clinics operate inside 73 Walmart stores. As I discuss in Section 2.4.1. of the new 2016 Economic Report on Retail, Mail, and Specialty Pharmacies, many factors support continued retail clinic growth. While 2016 may see little growth, I still expect the number of retail clinics to reach 2,300 to 2,500 locations by 2018. That said, don't forget that a good forecaster is not necessarily smarter than everyone else. He merely has his ignorance better organized.